Inez A. Brown, age 85, of Carrington, ND, passed away Saturday, April 13, 2019, at Golden Acres Manor in Carrington. Inez Nysted was born February 7, 1934, in Carrington to John and Ruth (Schlotman) Nysted. She attended grade school at a rural school in Haven Township and graduated from Carrington High School in 1953. Inez worked at the S & S Coffee Shop. Later working for Mrs. Voglewede at their home until she married Evan Brown on April 4, 1954, at Trinity Lutheran Church in Carrington. 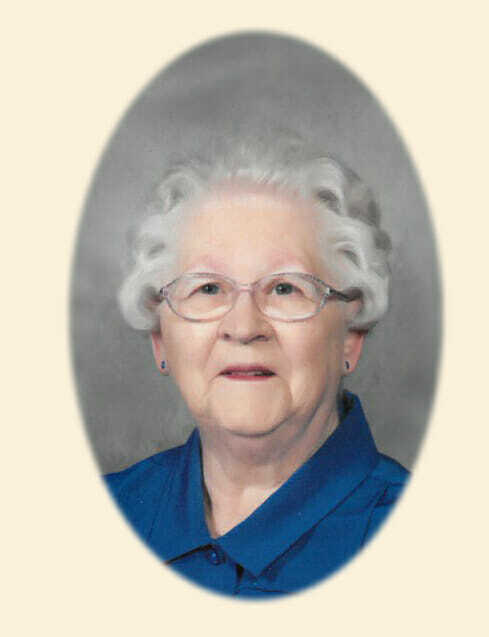 She was a Country music fan, enjoyed embroidery, and playing the piano. She was a member of the Everglad Homemakers. Evan passed away May 8, 2007; Inez remained on the farm until the fall of 2013, at which point she moved into an apartment in town. She then entered Golden Acres Manor on April 13, 2015. Inez is survived by her children, Merrilyn Dahl, Twila (Curt) Klein, Janel Rice, all of Carrington, Mark (Jen) Brown of Burlington, IA, and Michael (Julie) Brown of Carrington; grandchildren, Amber (Nathan) Kruse, April Klein, Easton Brown, Eric (Tori) Rice, Karlee (Eric Griffin) Brown, Kevin Rice, and Lucas Brown; great-grandchildren, Addie Urness, Braden Kruse, Brooklyn Griffin, and Jensyn Rice; sisters, Phyllis Gussiaas of Carrington and Elsie Polutnik of Missoula, MT; sisters and brothers-in-law, Jean Larsen of Owtonna, MN, George (Dotty) Brown of Devils Lake, ND, Alice Neumiller of Jamestown, ND, Gerald Brown of Bowdon, ND, Lynda Brown of Eagen, MN, and numerous cousins, nieces, and nephews. She is preceded in death by her husband, Evan; son Dale; parents John and Ruth Nysted; and sister, Carol Sutherland. Visitation will be Tuesday from 9:00AM-7:00PM at Evans Funeral Home, Carrington. Funeral Service will be held Wednesday, April 17, 2019, 2:00 PM at Trinity Lutheran Church, Carrington. Thinking of you and your family Mark Brown. The Mercer family prays that through your grieving that you take time to reflect on great memories with your mom and think about the positive impact she had on your life. I know you talk often about how she taught you to cook and the good times on the farm. Be safe and enjoy your family and friends. Sending you sympathy and prayers. Your Mom always had a smile and a kind word. Thinking of you and your loss. I’m sorry to hear of your mom’s passing. You and your family are in our prayers.